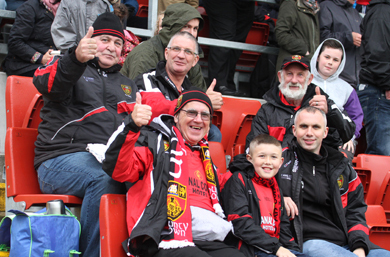 Down supporters from Ardglass and Killough at Pairc Esler. Down suffered miserably at the hands of a strong Tyrone team at Pairc Esler in the quarter final replay, but Down Manager James Macartan said: “I don’t think it was an eight-point game. I’m very proud of the shift every player put in tonight. We went down fighting today”. Macartan said his team may be bruised and defeated but they will shake it off in a couple of days and try once again to reach the Ulster final coming from behind which Down have done before. Tyrone were through the match showing signs of being the dominant force, and must have thought that it was their lucky day when Tyrone keeper saved a penalty in the first two minutes when Peter Harte fouled Down’s Conor Maginn breaking straight for a certain goal. Aidan Carr had a golden opportunity to strike at the heart of Tyrone for Down but Tyrone keeper Niall Morgan read the lick well and blocked him. The sighs from the Down fans were palpable as this was a huge chance to backfoot their rivals. Soon Tyrone were forcing much of the play in the Down half and saw Ciaran McGinley shooting wide, then soon after McNiece was close in to the Down goal and put the ball over the bar to open the scoring for Tyrone. Then keeper Morgan took a free and converted or a point for Tyrone. 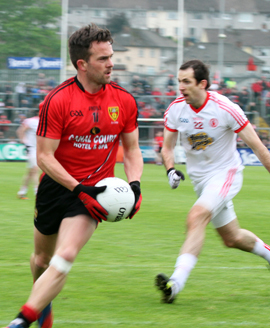 Down player Mark Poland eyes the Tyrone crossbars. Down started to hold possession well and were probing for a chink in the Tyrone brick wall. The action showed Down’s Mark Poland making a great cross from the right to Niall Madine but Tyrone’s Morgan was on form and blocked the volley at the net. But Down were backed off into their own half and started to look the lesser team as Tyrone were moving up a gear and scoring a couple of valuable points. However, Down then fought back and Tyrone’s Justin McMahon pulled down Jerome Johnstone and Donal O’Hare made no mistake in splitting the posts with his kick. This was followed by another point by O’Hare soon after. But just as Down were trying to catch their second wind, in a fast actioned game, Tyrone’s Ciaran McGinley struck Down a blow from a scramble in front of goal and this was soon followed by another point widening the gap to 0-3 to 1-05. Down were starting to look as though they needed to step up to the mark quickly but this was difficult as they were not winning possession from kick out and high balls very well. Down’s Conor Laverty took a point in play after a good start built up by the men in Red and Black and this was followed by Conor Maginn also nailing a valuable point to keep Down in touch. Down were almost on a revival when Aidan Carr nailed a point from a very sharp angle with Down again showing they could carry the ball forward into the striking area with confidence. By the 32nd minute the score hung at 0-6 t0 1-06 and Down was still in there with a chance. Just before half-time O’Hare took another vital point for Down to close the gap to just 0-7 to 1-06 keeping Down in touch. Early in the second period Tyrone struck a blow when the ball moved from O’Neill to McCurry with Ciaran McGinley finishing placing the ball in the top corner of the Down net to put his team in the driving seat. Tyrone certainly brought the game to Down when the visitors again struck with a point from McGinley. Down tried a fight back and the effort saw Neil Madine shoot wide. The Down team were starting to look under pressure from a slicker Tyrone but their resolve was never in question. One great move from Madine, Poland and Gordon almost saw Conor Maginn break through for a goal opportunity. Even with two goals behind Down knew from past experience they could come back on Tyrone but at seven minutes in and Tyrone clocking up another prescious point is was looking increasingly uphill. Conor Laverty was as expected battling well for Down and crossed to Mark Poland who took a point. Then Down began to raise their game a little and pressed into the Tyrone half more. A good move from O’Hare passing to Laverty and back almost saw an opportunity open for a goal but O’Hare hit over the bar for a point. Both teams went through a lean scoring period battling for supremacy. But the tilting point in the demise for Down came 17 minutes into the second half when Tyrone won a penalty as McCurry was taken down by Declan Rooney. Peter Harte converted it beating Down keeper Brendan McVeigh who read the kick but just could not get his fingers to it. Then the temperature of the game heated and a first yellow card was given to Tyrone’s Mattie Donnelly. Down sub Jerome Johnston was unlucky when he hit the post in a goal mouth scramble which could have kept Down’s hopes alive but at 15 minute remaining and the scoreline at 0-9 to 3-08, Down had it all to do. Tyrone were looking very comfortable as Down failed to rally in the second half as they did last week. Tyrone were intent on punishing Down and made a number of strong attacks keeping play away from their own goal. But Down did make several incursions into Tyrone’s territory with Conor Garvey shooting well but McKenna returned a point for Tyrone. Down’s sub Benny Coulter failed to turn the situation round as he grafted up front with O’Hare and Laverty. Tyrone had done enough to win the replay. O’Hare claimed back another point from a free against Down but this was a small consolation. The game slipped into extra time as Tyrone were pressing forward in control over a Down side that failed to make a real dent on Micky Hart’s men. Tyrone looked the slicker team on the day having raised their game and showing more confidence and control and could on performance be the 2014 winners of the Ulster championship. But Down is not finished yet in the Championship Manager Macartan has indicated! 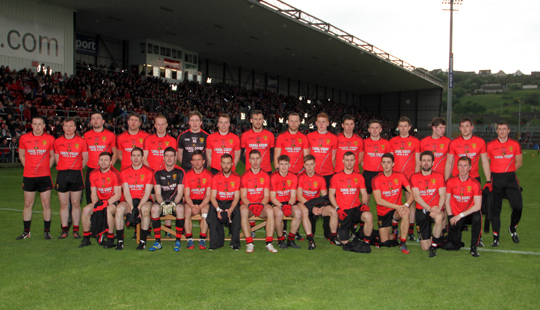 The Down team that faced Tyrone in the Ulster Championship quarter final replay.